Inspired by the Wahoo, or Ono fish, as it's known to some locals. 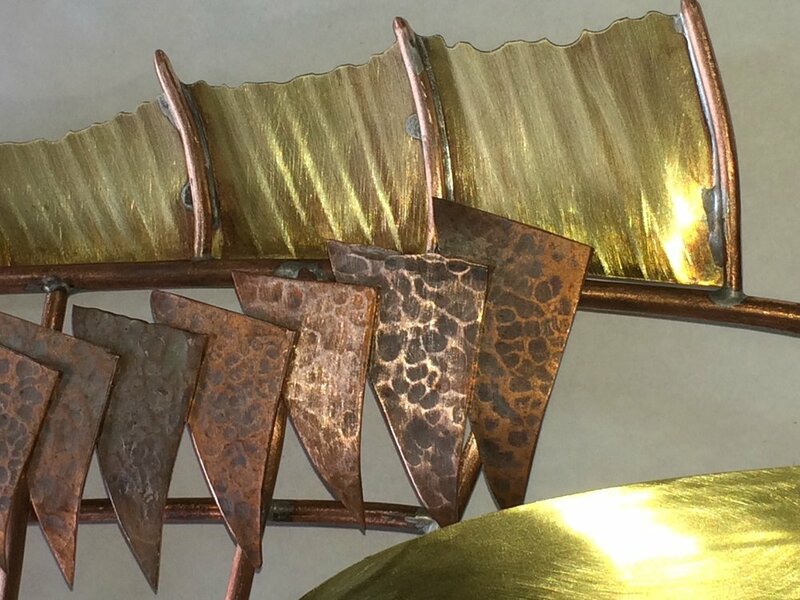 About 28" long, copper & brass and silver solder. I used a common glass marble for an eye and illuminated it from behind with an LED candle device. Second in the series. Just trying differing methods of defining the shape and space and attributes of this type fish. No illuminated eye this time... I usually avoid doing the same trick twice. 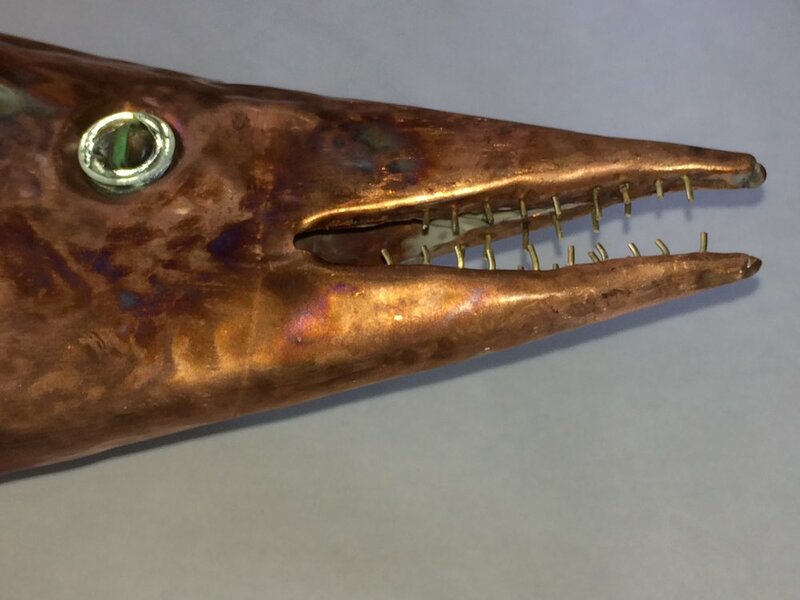 About 23" long; copper & brass... and a glass marble. Just a 'dramatic' shot to show off the teeth. Third, and I think last, in the series. 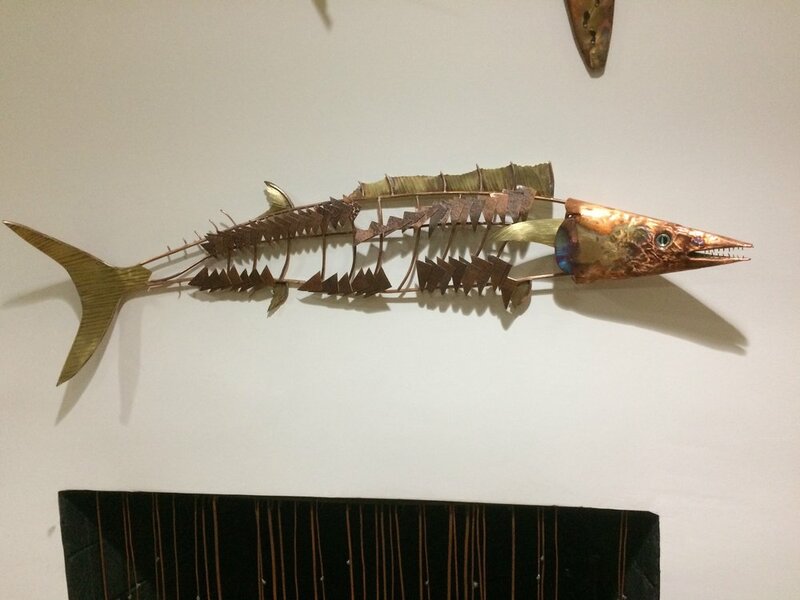 About 41" long; copper & brass... and a marble. I experimented with a different approach to the teeth. Instead of hammering them out of sheet metal I drilled a bunch of holes in the sheet metal for the head, inserted a length of brass wire into each hole and then bonded them all to the inside of the jaws. So, while they do look a bit ragged and uneven, the illusion of actual teeth comes off good, I think. And the eye... still using marbles but this time I used a lapidary wheel to grind and then polish the marble until only a fragment of the 'pupil' is left. This approach leaves the glass much more translucent and life-like.